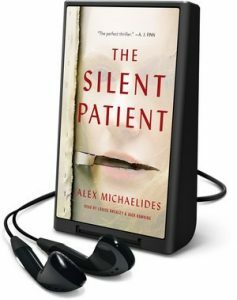 My parents were recently in New Mexico, and a friend of theirs showed them the audioboook she was listening to on a device called a Playaway that she had checked out from the Alamogordo Public Library. I had never heard of it, and I can’t help but feel like I should have known about this. It’s easy to use, great for technology-challenged patrons. And it’s small. It’s about half the size of a deck of cards. It bookmarks the spot where you left off so you don’t lose your place in the book. You can also lock the controls so that you don’t accidentally fast forward or something while you’re listening. It requires 1 AAA battery, which the company says lasts for about 30 hours of play. You will also need earphones or speakers. You can plug it into your car’s aux jack. Please let me know in the comments section if your library carries these (I know the LeRoy Collins Leon County Public Library has some), and how they are working for your patrons. In today’s blog post, I want to share with you a series that I absolutely love: The Chronicles of St. Mary’s by Jodi Taylor. 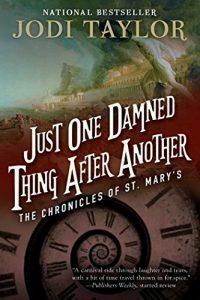 The first novel in the series, Just One Damned Thing After Another, introduces us to our heroine, Dr. Madelaine Maxwell, known as Max, who joins the St. Mary’s Institute of Historical Research. St. Mary’s consists of a bunch of disaster-prone historians who study major historical events in contemporary time. Do NOT call it time travel! The goal of the historians is to observe and document to try to find the answers to some of history’s unanswered questions – and not die in the process. In the first novel, they time travel…er, visit 11th century London, World War I, the Cretaceous Period, and the destruction of the Great Library at Alexandria. The books are hilarious – seriously laugh-out-loud fun! I love them so much that I also read all of the short stories and novellas in the series, and I am not usually a fan of short stories. I found the books on Amazon (I don’t know how), but I probably wouldn’t have found them in a library because they would be shelved in SciFi, and I don’t read SciFi. I mean, obviously I do, or I wouldn’t have read these books, but I don’t actively seek SciFi materials. Other historical periods the historians visit include Jack the Ripper’s London; the murder of Archbishop Thomas á Becket; Stone Age hunters; a mirror-stealing Isaac Newton; dodos eating cucumber sandwiches; the Great Fire of London; and the Bronze Age of Troy. But will they ever discover why all the travel pods smell like cabbage? I highly recommend this series, and I also recommend that you read it in order. Enjoy! Edit: Thanks to Vicky Stever’s suggestion, we will order the entire series on RBdigital. BRIAN HART – Brian is the Deputy Director of the Greensboro Public Library & Board member for EveryLibrary, the only library-related political action committee. Brian is a fun, interactive speaker (I saw him at the Northwest Regional Library System staff development day a few years ago), and you will leave the conference ready to go engage with your community! Brian will present both the opening and closing sessions. COMMUNITY ENGAGEMENT IS HOT – Libraries can no longer wait for the community to come to them. They must seek out community members, and the presentations at this conference will give you some ideas, whether you work for an academic library, public library, or special library. ALL STAFF MEMBERS COUNT – Community engagement is not just something for management. All staff members can contribute to community engagement. Are you a member of a local club? Attend church regularly? Play on your spouse’s softball team? These are all opportunities for community engagement. HEATHER HAS A GREAT TITLE FOR HER PRESENTATION – How can you not want to attend a breakout session entitled “The Last Book Club: Love, Rage, and Squandering Flowers.” (I mean, just who is squandering flowers? What kind of lowers?) But seriously, Heather will be speaking about senior outreach, and with our rapidly aging population, this is a topic we all need to know more about. INCREASE ACADEMIC RETENTION RATES – It’s great when colleges and universities can increase admission rates, but how can libraries help retain these students, especially commuter students, who face unique challenges? Maria Goodspeed and Melissa Davis of Pensacola State College will provide you with all the answers. SARAH PLAYS THE DULCIMER – I’m not quite sure what a dulcimer is (looks like a weird guitar thingy…), but playing a musical instrument can increase happiness, confidence, and brain power, and I could use all of that! So could your patrons, so attend Sarah’s breakout session and learn how to start a music class at your library. SUBJECT LIBRARIANSHIP IS HOT, HOT, HOT – Academic libraries have learned that the best way to facilitate a working relationship between the library and faculty is to have subject librarians assigned to academic departments. Mohamed Berray and his colleagues from FSU will give you tips on how to implement or improve your own program. CONTINUING EDUCATION IS VITAL TO ALL LIBRARY STAFF – Besides providing ideas and knowledge, continuing education can re-energize you and your staff! When my director asked me to start a dulcimer class at my library, I was incredulous to say the least as to whether it was a good idea. “Who cares about dulcimers?” I thought. “It’s a simple enough instrument, and it is not hard to learn. They’ve got to be passé by now.” Boy, was I wrong. After a fair bit of convincing on my director’s part and watching Robin Shader’s PLAN Quick Class: How to Start a Ukulele Program in your Library I set about starting a dulcimer program at my library. The first thing I did was go to my local guitar store and see if they still carried any. They were actually in the process of downsizing. But they were able to tell me a little about what they watch out for with instruments and a couple brands they avoided as their workmanship was suspect. Armed with that information, I set off to the trusty internet. After a bit of looking and reading reviews, I found a company based in California who made dulcimers and sold them to schools and other places. I gave them a call, talked about what my goal was, and asked if their advertised price was one they would be willing to beat given I would need multiple. Thankfully, they were amenable to not only offering a price just a bit above cost, they were even willing to send a dulcimer over for me to inspect for quality — they were so sure of their product. So, sure enough their product met my expectations, and the library placed an order for some to be used in the program. From there the library advertised the same way that it advertises everything: on the website, with a press release, flyers, and Facebook event. After a few fits and starts, we have a steady, weekly, dulcimer class. Many students use our dulcimers, but a good few of the regulars have decided they wanted their own. Our routine seems to work pretty well at this point. Prior to class, I pick one song to work on with everyone based on their performance in weeks prior. I always have simpler songs on hand as well in case new people come in. Some patrons are so excited about the class they arrive early just to help set up and make sure the instruments are in tune. When we start, the flow of the class is dictated by the attendees and their proficiencies. If it is mostly returning students I let them pick songs to warm up/review. I prefer encouraging us to play songs that we worked on in weeks prior so that some of the more modest players can see that they are indeed improving and making progress. After review, we move on to the new song for the evening. I may play the new song once so that everyone has an idea of what we are aiming for. If it is a very familiar song then I may skip the example part, and go straight to working through the song one measure at a time with everyone. If it is a small enough class, we will work on pieces together for the first half of the class in this fashion, while in the second half I’ll pull students aside and work with them individually so that they don’t get lost in the group. This pattern seems to have served me well thus far. I’ve had patrons from elementary school on up in attendance, regulars are getting to the point where they help others in class and, without fail, new attendees always seem surprised by their progress by the end of the evening. Do you remember the joke about the two men being chased by a bear where the punchline is one, “I don’t have to outrun the bear, just you?” You don’t have to be the best at anything to teach, you just have to stay ahead of the group. There are times when I stumble but patrons are there to have a good time, not question your proficiency. Is there a: dulcimer, ukulele, underwater basket weaving group in your area? Check in with them before you get started! Groups are as varied as the people in them. Some groups are very set in their rhythm. They may not want to leave their cozy meeting space to be part of your program, but they sure have tips and input. I’ve yet to see a group that would put guarding their “territory” over spreading their passion. Publicity: A local newspaper picked up that our library was giving lessons. After that article ran attendance skyrocketed. Is there a newspaper, blogger, media personality you know of? This is one thing on the dulcimers I wish I had known before. I learned from Sarah Burris in the Northwest Regional Library system that cardboard dulcimers are a legitimate thing. Now these wouldn’t be ones that you’d send home with people but it is definitely a gateway or opportunity to test the waters. Above all, have fun! Pick something you enjoy. If you enjoy x hobby, chances are you aren’t the only one. 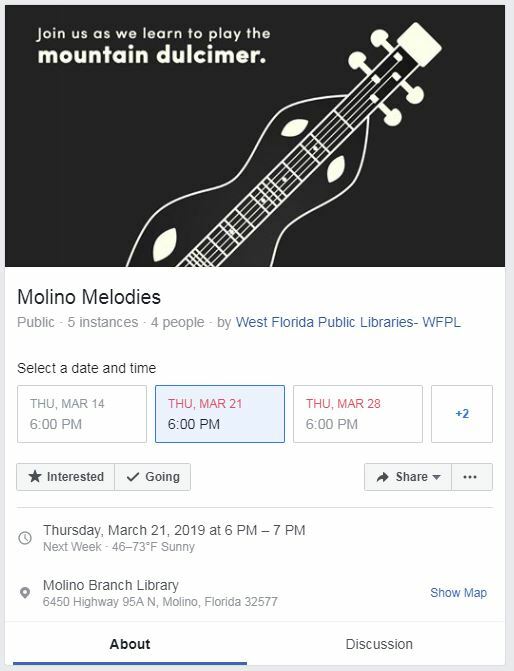 I am so proud to say that the Wakulla County Public Library is not just books. Our library strives to provide services and programs that offer help, learning, and entertainment. Now the Library can help in a bold new way. Enter the Library of Things. Need to trim a tree limb? Come check out a pole saw. Have family visiting with a small child? Come check out our portable toddler bed, our play pen, or our booster seat for your dining room table. Having a party? We have a pre-loaded karaoke machine and yard games like horseshoes, bean bag toss, and ladder toss. Want to try out camping but not sure that you are quite ready to commit? Check out our four-person tent and camping lanterns. 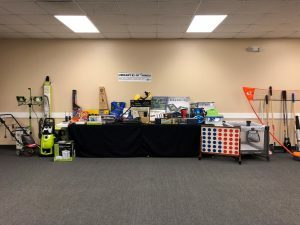 Other items include yard tools, a pressure washer, a ukulele, badminton, stud finder, laser level, caulking gun, extension pole for painting, adult and child life vests, telescoping extension ladder (it will fit in the trunk of your car! ), tools for digitizing VHS and cassette tapes, and so much more. This exciting collection was purchased by funds through a Panhandle Library Access Network Innovation Project, and some items have even been donated by patrons. We hope to continue to add useful items to the collection as more funds become available. Any adult (user agreement required) with a library card clear of overdue items and fines can check out items from the Library of Things. We ask that they only check out one item at a time, but we will consider multiple checkouts on a case-by-case basis. Checkout is for one week with no renewals. Wakulla County Public Library and the Library of Things: Why buy when you can borrow? The Library of Things was so easy to start using our PLAN Innovation Project funding. We were only awarded about half of what we requested, but in a way, I am glad that is all we received. If we had been granted the full amount, we would have been overwhelmed. Starting a Library of Things is simply as easy as polling your patrons to see what they need/want, purchasing the items, cataloging them, and putting them out for circulation. The challenges are finding somewhere to store them and figuring out the best way to tag them as library property in a tasteful way. We were able to premiere the Library of Things during our annual Take Your Child to the Library Day on Saturday, February 2nd. Things started checking out the very next week, and the people borrowing them expressed a great amount of gratitude about us being able to make these items available for them to use. We are always excited to be able to provide more services for our patrons, but this project has already been so very rewarding. We also have one really cool story about the Library of Things already. The first family that checked out the Metal Detector did so to find a time capsule that their son, who is about to graduate from high school, buried in their yard upon starting Kindergarten. They buried a metal bat over the top of it, but have no clue where they buried it. Library of Things to the rescue! Enrollment for commuter colleges will continue to trend upward for the next several years. Encouraging news is that among these enrollees will be first generation and minority students, but quite disappointingly, a large percentage of commuter students will leave college before they complete their degree requirements. This statistic compels library staff to examine the role we collectively play in helping the cause of retaining these capable students, and it IS a cause. As the hub of many campuses, the library is where all students potentially intersect with faculty, with staff and, perhaps most essentially, with each other. 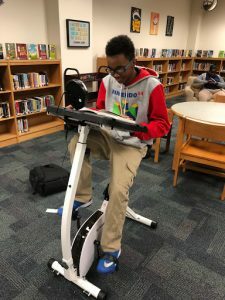 The library is where students may make a connection that inspires them to stay the course. We should not underestimate the power of the influence a library can have on students, for the library is a community within itself. It is a community where the environment and the effort of staff can make a difference in the outcome for all students. Investing in our students is investing in our community at large, and we must not only comprehend the gravity of our role, but we must also act. While all library staff believes in the importance of our mission in helping all students excel, it is what we put into practice that can truly affect the results. We must ask ourselves, what are some practical ways in which we can help our students succeed? First, we can actively work to combat costs for students. Cost is one of the leading factors in losing students, but libraries can aid in mitigating this problem in numerous ways. Enlisting faculty to have books on reserve will allow students to have free access to required materials. Actively communicating with departments in a liaison capacity will also result in obtaining relevant academic materials in the library. Traditional collection development techniques and collaboration with individual faculty members to ensure materials in circulation line up with course assignments is also beneficial. 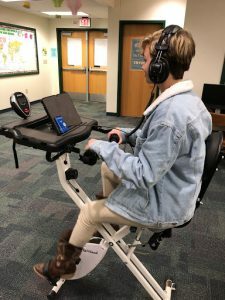 In addition, increasing more modern efforts to acquire Ebooks will allow students to access material remotely and remove obstacles that transportation issues may cause commuter students. Influencing adoption of Open Educational Resources (OERs) and using programs such as LibGuides and Curriculum Builder would allow faculty to build their classes within a learning management system entirely utilizing free library resources. These are all viable and implementable solutions to help lessen costs for at risk students. The need for excellence in our libraries can influence and drive the need for excellence in our students. Other ways we can work toward student success is to use best practices for research instruction, continually revising classes to maintain relevancy (fake news vs. academically sound resources) and working with colleagues to have a uniform presentation of material. Focusing on students’ needs with individualized help from reference desk, be it technical or research oriented can be a factor in helping students achieve in classes, one assignment at a time. Yes, working to build liaison relationships with faculty, creating Research guides/LibGuides and pointedly ordering materials to support the curriculum takes a collective enthusiasm and effort amongst library staff to make it happen, but where student retention and success is our end game, when the effort is made, everybody wins. 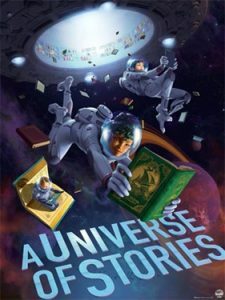 This year’s Collaborative Summer Library Program theme is “A Universe of Stories.” To help libraries prepare, the Florida Division of Library and Information Services collaborated with NASA@ My Library and the STAR Net Libraries to provide a hands-on workshop in Tallahassee. Last week’s blog post covered the STAR Net Libraries website, which has a plethora of resources available for upcoming summer reading programs as well as resources for general STEM programming. This week, I’m going to provide information on some of the activities we did at the workshop. The slide presentation for the workshop can be accessed at https://goo.gl/PyrHQ8. The Red Mars Game that we played at the beginning of the workshop was a great ice-breaker. Presenter Christine Shupla had us all get up in one big circle. Then she started throwing imaginary planets to us. “Mars is small, so don’t lose it,” and then she’d call out someone’s name to catch Mars. That person would then “catch” the planet, call out another person’s name, and throw the planet to them. And so on. She also introduced Saturn by spinning her finger around in the air (“rings”), and Jupiter as a huuuuge planet, so she held her arms out wide. And Pluto is tiny, so we had to be extra careful with it. It may sound corny, but it was actually a lot of fun! The next activity was sorting space objects (planets, constellations, galaxies) by either how far they are from us or how big they are. Christine provided pictures of the objects on paper, and each group tried to put them in order. It made for some lively discussion in our group: “Hubble only takes photos of far-away objects; it is actually located in Earth’s orbit.” J You can duplicate this activity by going to http://clearinghouse.starnetlibraries.org/astronomy-and-space/77-how-big-how-far-how-hot-how-old.html and downloading the PDF with the pictures. And the correct answers! Presenter Andy Shaner next discussed the scale of our solar system. He introduced an activity called “Jump to Jupiter” and a group of attendees demonstrated how far apart the planets are. He said to really show the scale of the solar system, you would need three football fields to go from the sun to Pluto. Wow! Slide #17 shows how many “jumps” between objects. You can duplicate this activity by going to http://clearinghouse.starnetlibraries.org/astronomy-and-space/65-jump-to-jupiter.html. The activity can be scaled down, of course. Some participants plan to use a community walking path to demonstrate the scale, similar to StoryWalks. You can also visit http://www.exploratorium.edu/ronh/solar_system/ to learn how to build a scale model of the solar system. Then we assembled the moon’s phases with Oreos. Mmmmm…. 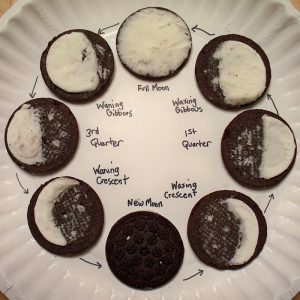 You can duplicate this tasty activity by going to http://clearinghouse.starnetlibraries.org/astronomy-and-space/83-loony-lunar-phases.html. Other activities included creating craters (http://clearinghouse.starnetlibraries.org/astronomy-and-space/89-crater-creations.html), teen moon ooze (http://clearinghouse.starnetlibraries.org/activities/81-teen-moon-moon-ooze.html), creating a UV tester (http://clearinghouse.starnetlibraries.org/earth-science/93-uv-kid.html), making a supernova (http://clearinghouse.starnetlibraries.org/astronomy-and-space/214-let-s-make-a-supernova.html), creating space-landing gear that will protect your astronauts (http://clearinghouse.starnetlibraries.org/engineering/235-touchdown.html) [full disclosure – our group struggled with this; we had astronauts flying out all over the place! ], and a trip to Mars (http://clearinghouse.starnetlibraries.org/astronomy-and-space/67-trip-to-mars.html). Another cool resource that you can download to your computer for free or on your mobile device for a small fee is Stellarium (https://stellarium.org/). Stellarium is a free open source planetarium for your computer. It shows a realistic sky in 3D, just like what you see with the naked eye, binoculars, or a telescope. And if you’ve ever wished you could show lunar and meteorite samples, you can borrow some from NASA (https://ares.jsc.nasa.gov/interaction/lmdp/). However, you do have to attend a training session first, and those are normally held in Houston. You can also request that STAR Net send you pop-up traveling exhibits at https://www.lpi.usra.edu/exploration/education/exhibits. Designed for libraries, these banners use colorful images and text to share current lunar and asteroid science and exploration stories. The displays can be used to excite and engage patrons in further exploration through library resources and programs. This was a really fun workshop and provided great activities for your summer reading program and any other STEM programming you do! Fellow attendees, if I missed anything (and I’m sure I did), please share in the Comments section. So check out STAR_Net Libraries – there is a ton of resources available for STEM programming! Next week, I’ll cover some of the activities we did at the workshop. I have to pinch myself sometimes when I think about my library position. As the social media coordinator for the University of West Florida libraries, I love that the lines of work and play are often completely blurred. My work day consists of finding the right visuals and crafting the right words to demonstrate our value to the rest of the university. So, when I saw that PLAN was offering a scholarship to attend a professional development conference designed for library marketers, I jumped at the chance. It seemed like the perfect place to learn even more about how as a librarian, I could become a better communicator and gather fresh ideas on how to market UWF libraries more effectively. As it turns out, the Library Marketing and Communications Conference was my dream conference! 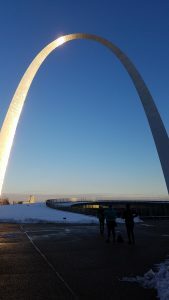 Set in snowy St. Louis, Missouri, the conference was bursting with librarians and marketing professionals who gathered to discuss, analyze, and master the art of marketing libraries. 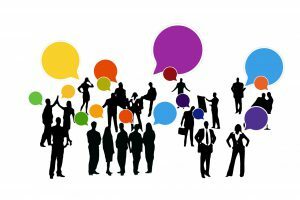 The multiple conference tracks presented a variety of options: Communications/PR, Graphic Design/Technology, Social Media, Marketing Strategies & Tools, Partnerships/Advocacy, Engagement, Internal Marketing, and Promoting Library Programs & Services. These unique tracks included sessions that were spread over the course of two days and each session typically allowed for active discussion and engagement among conference goers. A library “swag swap” accompanied these sessions with a wide variety of items from libraries across the country. Each brightly colored brochure and bookmark provided instant inspiration for future marketing endeavors and a great opportunity to see how other librarian marketers approached their print and digital outreach initiatives. While I found the sessions informative, the conversations between peers stood out as my favorite part of the conference. Meeting library creatives who shared and understood the thrill of finding the perfect image, the time and dedication it takes to create and edit a social media video, and the rush of waking up in the middle of the night with a flash of creative inspiration, was a unique comfort we felt as a collective. The conversations continued with numerous opportunities for dine-arounds and fun activities to meet up with new and old friends. It was great to see and hear the stories of both library marketing successes and failures. It was definitely the first conference I had ever been to where I felt like every session was a must-see. Hope to see you at the next LMCC conference!